The abrupt change from the third person to the first person from “they” to “us,” indicates that Luke had now joined the team. There are several such “we” passages in Acts. Where they occur we gather that Luke was personally present. It is really quite a team now—in fact, it is a quartet. There may have been others along also but we have four who are named: Paul, Silas, Timothy, and Dr. Luke. This is quite a delegation that crossed over into Europe. Perhaps it was Luke’s arrival that prompted the Macedonian vision, for Luke seems to have been a Greek. Or perhaps Luke showed up immediately after the vision, thus confirming it. It has been suggested that Luke was himself the “man of Macedonia” in Paul’s vision. Others think he hailed from Pisidian Antioch and that he was one of the Gentiles converted at the time of Paul’s first visit to that city. It has been suggested that Paul and Luke were old friends from college days, and that the two first met in Tarsus, where there was a notable medical school. 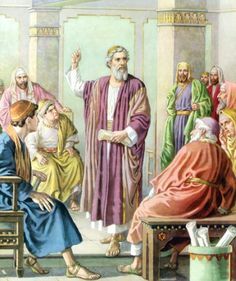 Another suggestion is that Luke was Lucius of Cyrene, one of the elders who commended Paul and Barnabas to the mission field from Antioch in Syria (13:1), and that he was the brother of Titus (Galatians 2:1). Others have suggested that Luke was a practicing physician at Troas when Paul and his party showed up there. The idea has been put forward that Paul at this time was in poor health and that he needed Luke’s professional services. In any case, Luke’s willingness to accompany Paul into Macedonia was an added confirmation of the vision. In one way or another, he joined the team at Troas, and his doing so was divinely ordained and another proof to Paul that his next mission should be in Macedonia. Timothy and Silas readily agreed, once Paul had shared the experience with them. Now four shared the vision of evangelizing6 Macedonia. The beauty of this passage for us is that it presents conditions with which we are very familiar. It shows how the Holy Spirit still guides when our intentions are in line with the Divine purpose, even when we see no supernatural sign. Whether it is an individual life that is filled with sorrows, or whether the perplexity of life is overwhelming, or whether the strife of national crisis is about us, God’s in his heaven and He is overruling and guiding, and out of the chaos He is bringing the cosmos. Our chief interest in this passage is not geographical but theological. It is made clear by three specific statements that Paul’s travels were guided by God. First, the Holy Spirit stopped him from preaching in Asia; second, the “Spirit of Jesus” prevented him from going into Bithynia; and third, a “man of Macedonia” in a vision called him to Greece. Paul was not traveling for pleasure or for profit; he was traveling as an ambassador of God. It is not surprising, then, that he turned to God for directions and that he took for granted a divine strategy of which his travels were only a single episode. The guidance apparently took different forms and shapes: the Holy Spirit, the Spirit of Jesus, and the vision of a man. The subject of guidance is one upon which the commentator may dwell a little longer. The rank and file of the people do not expect to be guided by God, and groups that have taken guidance most seriously have often reduced it to an absurdity and made God in the likeness of a messenger boy to tell us what to do next. The result is that guidance is either discarded as a superstition or scorned as a fad of religious adolescents. A clear and intelligible exposition of the guidance of God is therefore in order. rests upon the assurance that God has an all-embracing plan by which and according to which He guides us. That is what theology means by “providence.” It is somewhere between fatalism on the one hand and accidentalism on the other. Fatalism says that everything is arranged and planned beforehand. Accidentalism says that nothing is arranged beforehand. Belief in Providence says that there is a grand strategy within which there is room for personal freedom and response. 1. The providence of God is flexible enough to include free men (man’s free will). God does not plan what time you get up in the morning or what you put on. He leaves as much as possible up to you. Neither does He plan directly for a long spell of illness. He lets some things work themselves out and take their own course. His plan is more like the overall plan of a parent. A good parent plans for the development of his child. 2. The providence of God is forceful enough to prevent the possibility of ultimate failure. God’s plan has many setbacks, but he never gives it up. A foolish family feud like the one in the story of Joseph can be used by God to carry out His purpose (see Genesis 45). An exile, and imprisonment, a dark night, a miserable failure—all these things can be rearranged and weaved back into the pattern. 3. The purpose of the providence of God is to preserve life, not only to preserve the length of life but the quality of it and the richness of it. The purpose does not always make itself evident from day to day. Things often happen that would seem to have no point whatever and to contribute nothing to the total plan and purpose of a man’s life. But it must always be remembered that there is more to come, that the story is not yet over, that there is another chapter. For example, take my life, because it is very similar to the experience of many of you. My life was going in the wrong direction; I was a Christian, but you couldn’t tell, for I was deeply into sin, and getting in deeper every day—alcohol, carousing, cursing, with the wrong crowd, and not concerned about much of anything. I think you get the idea. But God had a plan for my life, and He stopped me from continuing to live that way when He brought Sierra into my life—a Christian who lived a holy life—my helpmate and wife. My God is a genius! That was the turning point, arranged by God to get me on the right path and though there have been more than a few setbacks I have continued on that path for 50 years. Praise God! Once a man is convinced that there is a divine plan which in turn is the expression of the divine will, and to which he can make an intelligent response, it is then possible to show him in what different ways God guides him to the fulfillment of that plan and will. The manner of the guidance will be different under different circumstances and for different people. 1 This was not another Spirit. It was simply another way of referring to the Holy Spirit. 2 For the Spirit as the Spirit of Jesus see Romans 8:9; Galatians 4:6; Philippians 1:19; 1 Peter 1:11. 3 When Pliny wrote as governor in a.d. 112, Christianity had already become widespread throughout the province. 4 They already must have had some thought of a Macedonian mission because they took the unlikely route to Troas. 5 A church may have been established at Troas as early as this first visit of Paul. Acts 20:5-12 indicates a Christian community existed there. Paul spoke of his witnessing there on a later occasion (2 Corinthians 2:12; 2 Timothy 4:13). 6 It is not a matter of preaching the good news to the Macedonians but of “evangelizing them,” bringing them into a new existence through the gospel.